Not Verified | The most dodgy airport I’ve ever seen. Didn’t think it was possible for an airport to be so bad. It has so many destinations you’d think it would be at least mediocre. Random cables some power are coming out from everywhere and no one seems to care to keep them even tidy or cover. 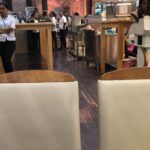 The buffet in the satellite cafe was extremely disorganised; cable’s running through the middle which power appliances, high tables with no chairs blocking the way, the buffet bar area having only one exit and entrance in a very tight space - it’s hilarious. And the food ! Old, cold, dry and stale. Nothing is clean, everything greasy, sticky or breaking. Seriously Ethiopia! Fix this. It’s a disgrace. The actual planes aren’t bad at all, but this airport is just scary. ✅ Trip Verified | On March 26 returning to the USA, we stopped in Addis Ababa Airport from Abidjan, Ivory Coast. I just exited the plane to go to the washroom, a woman from housekeeping stared as I was an Alien. I waited for me to exit the washroom, as I went to the faucet to freshen up. I felt someone watching me and it was her. She asked if I'm finished? I replied no. The watched me put on makeup and comb my hair. I hurried up and left as I gave her an evil look. She watched me walk down the hall. I felt now that was so rude and on caused for. "airport is to be avoided"
✅ Trip Verified | The terminal at Addis Ababa is dingy and on this evening was particularly busy. As a result of a long layover, I was advised that I would be given transit hotel accommodations and this was confirmed by Ethiopian in writing before leaving my home. But on arrival at the transit desk, there was mass confusion and a crowd of more than 60 people. Tempers began to rise and there was shouting as the transit procedures were painfully slow and there was confusion between economy class lines and business class lines. It took about an hour to secure the pass and when I asked for the small piece of paper needed to obtain a transit visa, I was told it was not needed. That proved to be wrong and when I got down stairs at immigration, more confusion and long lines ensued. I finally had to demand a transit paper from an Ethiopian Airlines staff and then got my transit visa stamp. Following this signs indicated that my baggage would be on carousel 3 - that was wrong. And after that I had to go through another bureaucratic mess to get a stamp on my transit accommodation document allowing me to get transit. And then I was told to walk, bag and baggage, to the parking lot and find the transport to the hotel. This, again, proved to be a disaster as there was no order and no cue and worst of all, no control. When the small van arrived to collect passengers for the hotel, about 15 people rushed it - it could only carry 5-6, and thus more tempers flared as people threw luggage into the back of the van and attempted to squeeze into the seats - the van driver did nothing to help. I cannot complain about the staff at the airport, they were trying their best and trying to smile in very difficult circumstances. The problem is in the system, rather the lack of any system, and too much bureaucracy. Also, the signage is poor and a lot of staff have no idea what they are supposed to be doing. 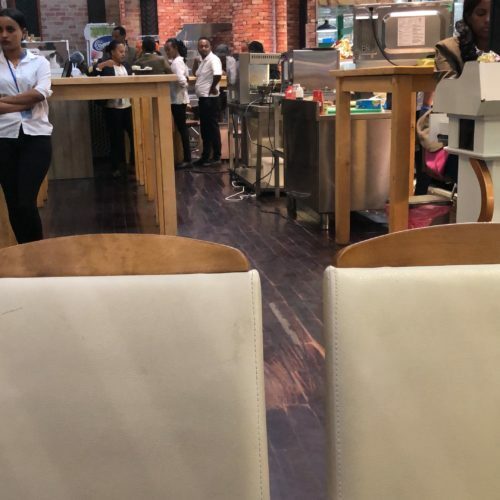 This airport is to be avoided and that is too bad because Ethiopian Airlines offers a reasonably good in flight product. ✅ Trip Verified | This is without doubt the worst airport I have used. It is chaotic, dirty and crowded. The staff are belligerent and unhelpful. Both business class lounges were full, the WiFi was pitiful and the toilets horrific. The staff were rude and unhelpful. This is the worst I have been treated as a Gold Star Alliance member by a participating airline. I will never use this airport again. A pity as the Ethiopian Airlines aircraft and crew are good. ✅ Trip Verified | I don't really mind the disorganisation or the lack of seating. What really annoyed me was the ridiculous price for food. $12 for an average cheese sandwich was the cheapest thing I could find. In my experience this makes it one of the most expensive airports in the world. If you wanted to have anything from the (average) buffet, this would cost you a cool $25. I just felt, after a lovely time in the country, that this was a bit cynical - considering there was no real choice once in the airport - especially if your flight was 6 hours late. I understand commercial reality and make a buck where you can etc. But this was over the top and will be people's last memory of a beautiful country. You should be trying to make people come back! ✅ Trip Verified | Dreadful, awful airport. Duty-free refuse to take their own currency and will take only dollars. Why? Do they feel their own currency is worthless or is there another reason to have dollars? The airport banks will not exchange their own currency for dollars, so no shopping or duty-free for me. Security took scissors from me that was under the legal 6cms for a carry-on. The TSA allows 10 cms! The staff just would not listen and her supervisor on the next conveyor who was absolutely useless and negligent at checking his x-ray screen, just nodded and she dumped it. I wrote twice to the airport and received no replies. They also have a useless web site. "should be great once completed"
✅ Trip Verified | The airport is under reconstruction and should be great once completed. Lounge facilities adequate for a transit stop. They do get crowded. Exception ET business class lounge. Passport control special line for business class, baggage delivery is on time. Special security lane for business class. Lucky if you get a jetty! "they wanted me to remove it"
Not Verified | I specifically required wheelchair assistance on my flight, due to the fact that I am fitted with a brace, following a knee athroscopy three weeks ago. That instruction was only carried out in Cape Town, very professional airport. In Bole International airport however, it was another story, but I can cope with it. When it comes to their metal detector screening, I explained to the personnel of the airport at the main entrance that I cannot remove my brace, as it offers some firm support for my knee, yet they wanted me to remove it. I then asked the agent, would he carry me through the metal detector door, to which he replied no. I added removing the brace is useless, because I have two screws inside my body, due to the surgery, I will have them permanently. That did not make sense to him and his supervisor, who was adamant that I removed the brace. I was very tense, I ripped my brace off, and walked through the metal detector gate on one foot, and of course, the metal detector made a noise, because of the two screws inside my knee. They searched me and then let me go. Put my brace back in serious anger and told them this was unacceptable, that in Cape Town airport, they would search you thoroughly and will never ask you to remove the brace, because they know you need it to stand! What really annoys me is the level of carelessness of these people, that they would complicate life to people with disabilities. 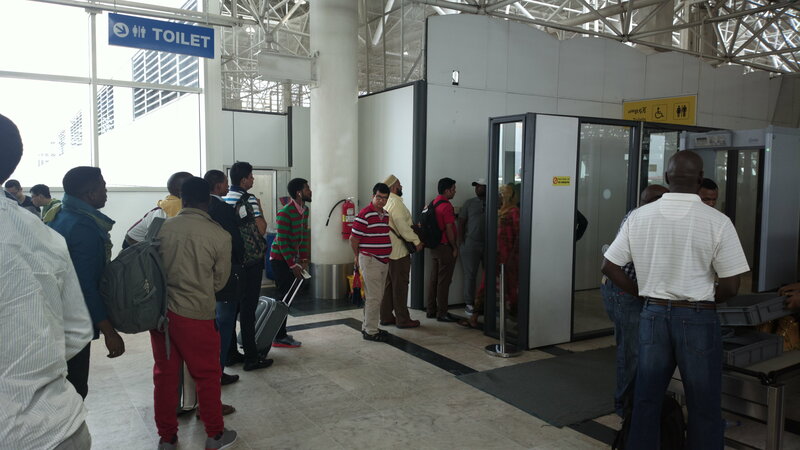 Because of that experience, I vow to never travel to that airport again, Ethiopian Airlines will no longer be on my list of airlines for sure. 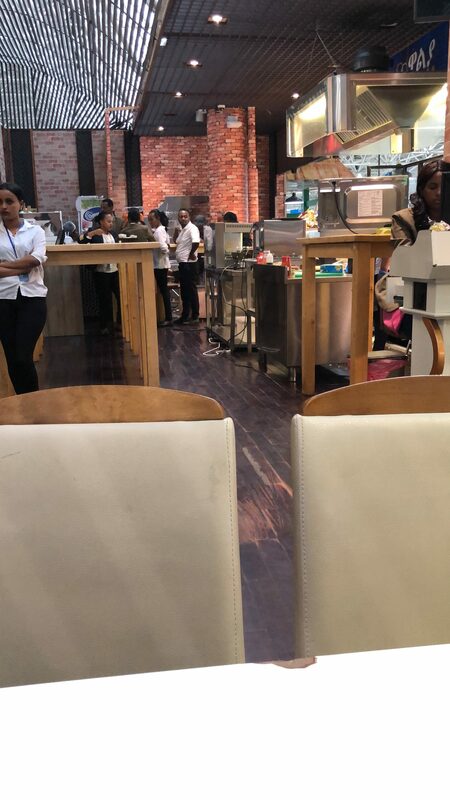 Not Verified | Addis Ababa’s Bole International Airport is one of the saddest that I have seen, the infrastructure is totally lacking for the number of passengers being handled. It has the appearance of an overcrowded train station where no one really knows what is happening. The only thing that tempers my remarks is that I was flying business class and thus, benefitted from some preferential treatment that cut down waiting times in lines. Still, the confusion and lack of clarity was almost overwhelming. Also, the uphill and up the stairs hike into the airport can be a little breathtaking: Addis Ababa is 7,500 feet above sea level so do not run! I arrived at the airport via a hotel shuttle that drops one off in a parking lot, rather than at curbside. One has to drag himself (and if he has luggage, that too) up a fairly long path to the terminal entrance, although porters are available. As this is not under cover, one can only imagine the mess it must be in the rain! Business class entitles one to an express security check at the front door and an express line for check-in and immigration. However, the express lines were violated by a number of people while I was there and that defeats the whole purpose. The waiting area is a mass of people all wandering about trying to determine where to go. Fortunately, I was entitled to the business class lounge - but it is in need of more space and improved facilities. Additionally, the restrooms are limited in size and they offer no shower rooms for transit passengers. At the moment, it has the feeling of being a temporary affair, not well planned. Proceeding to the departure gate from the business class requires another security check where one has to remove shoes and watches - and one is advised to plan ahead for this inconvenience as there is no place to sit to remove or put back on shoes - even at the special screening for business class. Watches should be removed and safely stored in a hand bag, too. Going through security, one gets the distinct impression that no one is really paying attention to what is going on, rather they are just going through the motions. Following the screening, there is an a special area where business class passengers can wait for some flights, but not all, so it is best to check with the agent who checks you in or with the people in the business class lounge. Again, there is what seems to be almost total chaos and far too little space for departing passengers. I was able to use the special area for business class, but be aware to pay attention for your departure. I was told that someone would come around and tell me when the flight for Manila was departing. That did not happen and luckily, I spotted some people who looked like they were headed my way and checked and indeed, it was my time to board. From there we went down an elevator and onto a bus to the plane, where we had to hike up the stairs into breathlessness in the thin air. I cannot fault the employees of Ethiopian Airlines as they really try their best in an impossible situation. But the airport is totally lacking in infrastructure to handle the number of flights it handles. And the way the building is designed is faulty: it is too narrow to be able to provide the space needed. What I don’t understand is why so much money was invested in beautiful, new aircraft for Ethiopian Airlines (A350’s and Boeing Dreamliner) and none was invested in upgrading Addis Ababa’s airport. It is a mess. Not Verified | Definitely made the trip that much more difficult. The airline itself seems good and seems to have a good reputation but the airport doesnt even come close. There is not enough seating in the place... at one point people where sitting on the floor for hours. Toilet facilties are absolutely abysmal most not working. There is not enough restaurants. The ones that are there dont take cards. Just an awful place.